Phil Hill preparing before a race. Born in Miami, Florida, Hill was raised in Santa Monica, California, where he lived until his death. He studied business administration at the University of Southern California from 1945-47 where he was a member of the Kappa Sigma fraternity. Hill left early to pursue auto racing, working as a mechanic on other drivers’ cars. Hill began racing cars at an early age, going to England as a Jaguar trainee in 1949 and signing with Enzo Ferrari’s team in 1956. 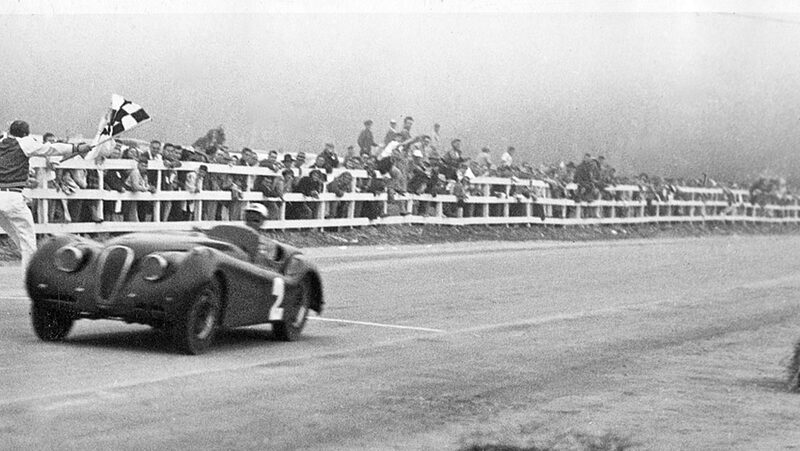 He made his debut in the French Grand Prix at Reims France in 1958 driving a Maserati. 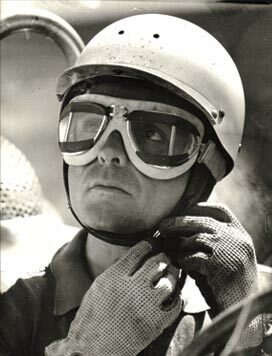 That same year, paired with Belgian teammate Olivier Gendebien, Hill became the first American-born winner of the 24 Hours of Le Mans  with Hill driving most of the night in horrific rainy conditions. He and Gendebien would go on to win the famous endurance race again in 1961 and 1962. Phil Hill has the distinction of having won the first (a 3 lap event at Carrell Speedway in a MG TC on July 24, 1949) and last races of his driving career, the final victory driving for Chaparral in the BOAC 500 at Brands Hatch in England in 1967. Following his retirement, Hill built up an award winning classic car restoration business in the 1970s called Hill & Vaughn with business partner Ken Vaughn, until they sold the partnership to Jordanian Raja Gargour and Vaughn went on run a separate business on his own in 1984. Phil remained with Gargour at Hill & Vaughn until the sale of the business again in 1995. Hill also worked as a television commentator for ABC’s Wide World of Sports. Hill had a long and distinguished association with Road & Track magazine. He wrote several articles for them, including road tests and retrospective articles on historic cars and races. He shared his “grand old man” status at R&T with ’60s racing rival Paul Frère, who also died in 2008. Hill was married to Alma, and had two children: Vanessa and Derek, and a step-daughter, Jennifer. After traveling to the Monterey Peninsula in August 2008 for the Pebble Beach Concours d’Elegance, where he had been a judge for nearly 40 years and the Monterey Historics, of which he was always seen getting behind the wheel of a race car. where he died after a short illness from complications of Parkinson’s Disease in Monterey, California on August 28th.